Head n Back Sleep Positioner Discounts Apply ! The Head n Back Sleep Positioner is a great way to have baby sleep comfortably on his or her back, the recommended sleep position for babies. 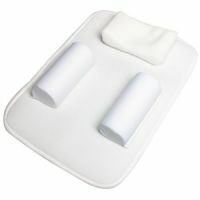 Because of the side pads, this makes a great sleep positioners for co-sleeping.